In response to the many, many requests I receive for vintage vinyl by the late and great Cowboy Copas, I am posting an LP with that very title! 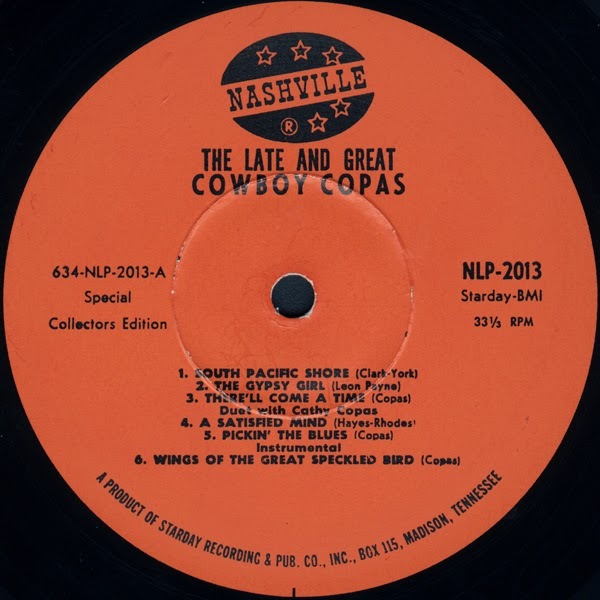 A previous post featured the second Copas collection released on Starday's Nashville subsidiary (NLP 2036, downloadable here); presented now is the first, Nashville NLP 2013, "The Late and Great Cowboy Copas". The tragic death of Cowboy Copas on March 5, 1963 brought profound sorrow to Country Music people throughout the world. In a stormy and forbidding twilight, Cowboy Copas along with his fellow Grand Ole Opry performers Patsy Cline and Hawkshaw Hawkins climbed into a single engine plane piloted by Randy Hughes. They took off for home in Nashville following a benefit performance in Kansas City that raised $3,000 for the family of a country music disc jockey who had lost his life in an auto accident. In foul weather, the plane crashed near Camden, Tennessee, and there were no survivors. As fate would have it, Randy Hughes, the pilot, was the son-in-law of Cowboy Copas and the husband of Cathy Copas who recorded many song favorites with her daddy. Randy was also Patsy Cline’s personal manager and an accomplished guitarist who backed up Copas and many other stars on their recording sessions. 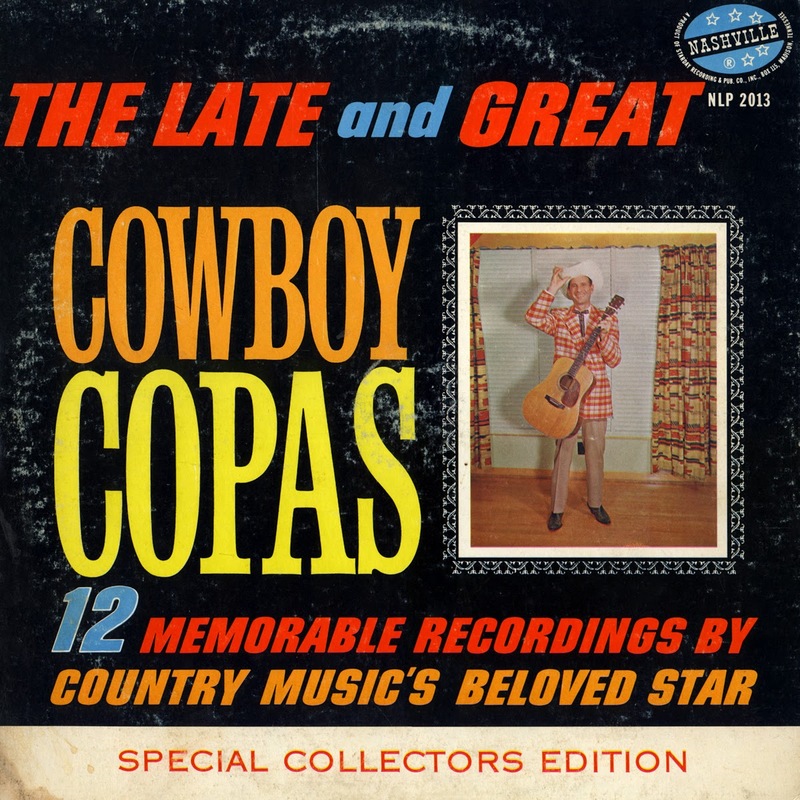 Only thirty days prior to the tragedy, a Cowboy Copas album entitled “Beyond the Sunset” was released and contained many songs of life and the hereafter. About 24 hours after the plane crash, another Grand Ole Opry star, Jack Anglin, of the Johnny and Jack and Kitty Wells show, was killed when his car ran off the road while enroute to prayer services for Patsy Cline. Although Cowboy Copas has joined Hank Williams, Johnny Horton, Jimmie Rodgers, and the other great stars in the next world, he has left a treasury of songs and Country Music for posterity. Cowboy Copas was an All Time Country Music Great. The Copas story is well known. Starting on an Oklahoma farm, he rose to Country Music fame as a Grand Ole Opry star with such hits as SIGNED, SEALED AND DELIVERED, TENNESSEE WALTZ, FILIPINO BABY, TRAGIC ROMANCE, and many others following World War II. Then in 1960, his tremendous smash hit recording ALABAM brought new fame and popularity and pressure for more and more personal appearances. Always a trooper, and true to the show business tradition, he traveled up to 200,000 miles per year entertaining, and making friends. Hs records were solid sellers and Copas excelled at singing love ballads or honky tonk songs. The people loved his open string, unamplified, flat top Martin guitar pickin’. He was a real pro as a master of ceremonies. His duet recordings with daughter, Cathy Copas, were extremely popular. And last, but by no means least, he was a standout performer on the sincere and happy “hand clapping” gospel songs that all Country Music fans love. If there is a “Hillbilly Heaven”, we feel that Cowboy Copas will be enthroned there in honor. Starday joins with Country Music fans everywhere in recognition of the great Country Music heritage left us by the one and only Cowboy Copas. 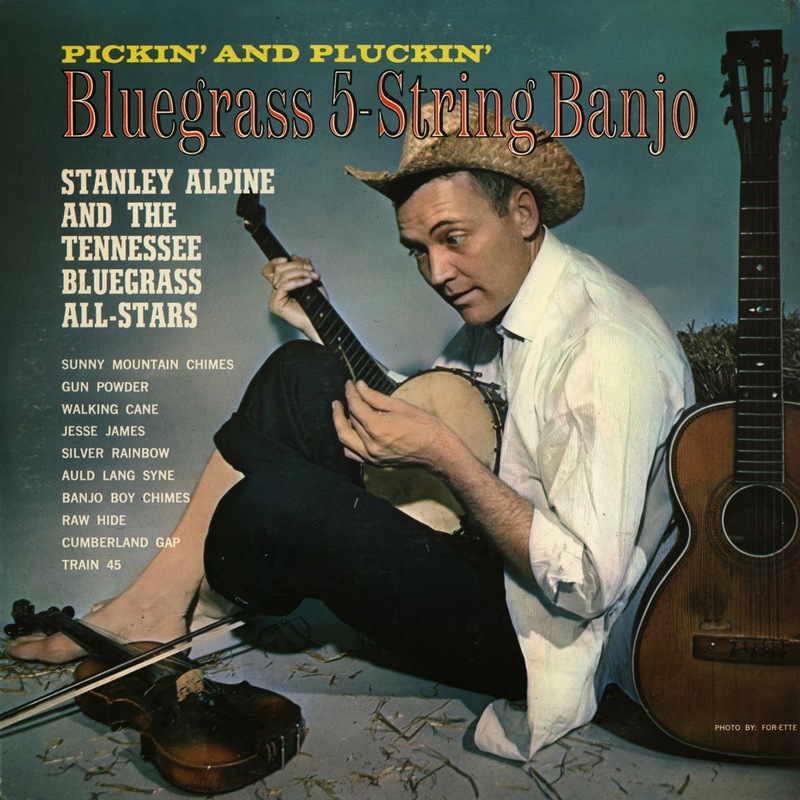 A strong candidate for the worst cover ever on a bluegrass album (this statement is not a challenge, as I'm sure there are others just as bad!) would be this ubiquitous 1964 collection of banjo instrumentals credited to the mysterious "Stanley Alpine And The Tennessee Bluegrass All-Stars". Issued simultaneously on various "throwaway" budget labels such as Palace, Countrytime, and like the present copy, Masterseal, it's the kind of LP that one often encounters today while scrounging through thrift shop bins and could easily be passed over as ersatz landfill fodder, hardly worth a second glance. Why a pseudonym was used for this LP is a mystery, perhaps it was a contractual issue or perhaps in 1964 the Osborne Brothers were not considered the "name" act they became after 1967's smash "Rocky Top" (although they were by no means unheard of or obscure). 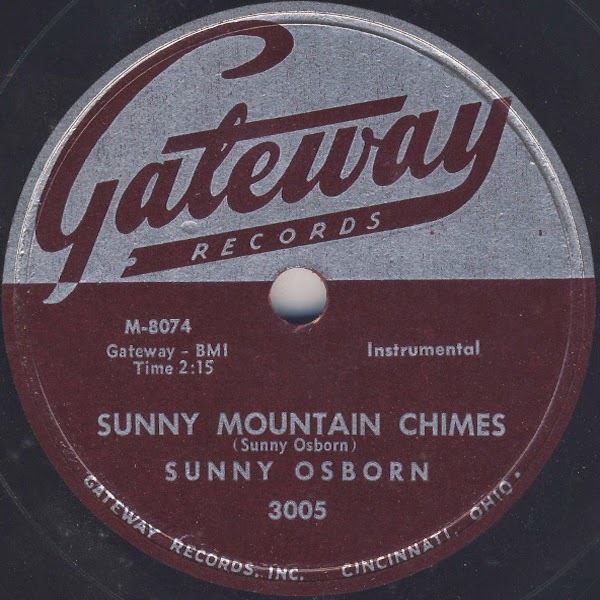 Incidentally, a few online resources have stated that Sonny and Bobby made these recordings under the name Stanley Alpine, but that is untrue, the recordings were released under Sonny's name many years before this LP hit the market. 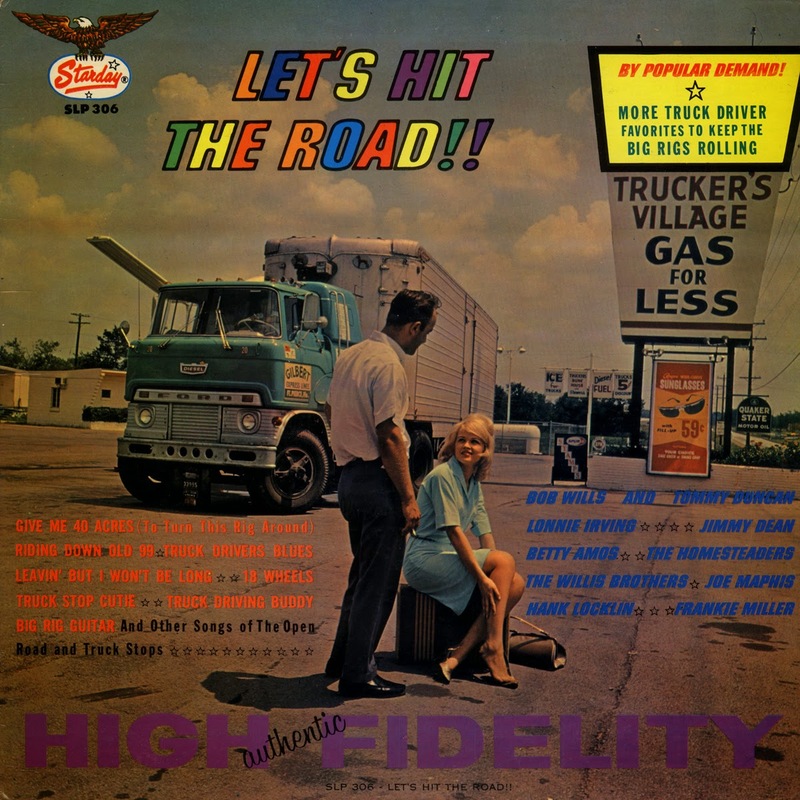 As the previous posting of "The Country Music Hall Of Fame" was so well received, I thought it might be wise to post another vintage Starday compilation, and one of my favourite LPs of this sort is the 1964 collection of truck driver songs titled "Let's Hit The Road!". Starday was a very active player in the trucker trend in 1960s country music, most famously with label stalwart Red Sovine. 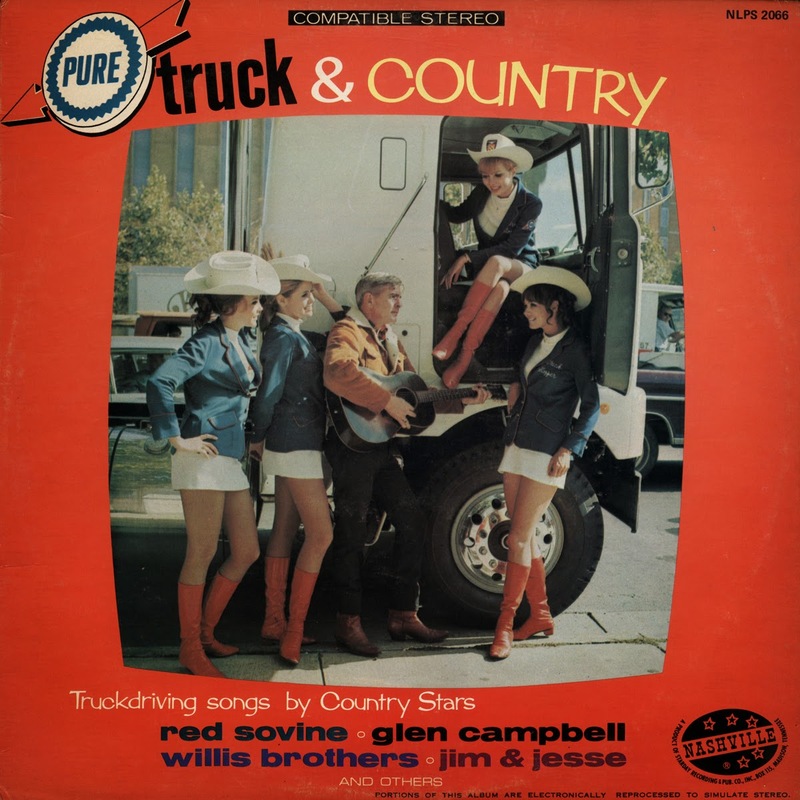 There are no tunes by Red on this LP, but there are twelve great tracks nonetheless, not only from the Starday vaults but also Hank Locklin's "Pinball Millionaire" and Jimmy Dean's "Bummin' Around" from the 4-Star catalog, as well as Bob Wills and Tommy Duncan's Liberty label remake of "Bubbles In My Beer". A few of my favourite tracks on the album are "Trucker's Vitus" by Lonnie Irving of "Pinball Machine" fame, "Truck Driving Buddy" by the great Frankie Miller, and "Riding Down Old 99" by Joe Maphis and an uncredited Rose Lee, sounding like she's inhaled some second hand smoke as the waitress in the song's narrative. The code of the truck driver has been given expression in many County Music songs by many of Country Music’s top stars. The lure of the open road, the dangers that lurk on America’s highways, the lonely hours at the wheel, the coffee stops, the juke boxes, and pretty waitresses are all a very real part of the truck driver’s world. It takes a lot of skill and know how to keep the Big Rigs Rolling and bring in the load on schedule. It also takes an ability to keep alert, a willingness to leave home, and last, but by no means least, it takes a person who will maintain the professional truck driver reputation as the most capable and most considerate drivers on our highways. Some of the songs in this album are not exclusively about truck drivers. However, such songs as BUMMIN’ AROUND by Jimmy Dean, BUBBLES IN MY BEER by Bob Wills & Tommy Duncan, PINBALL MILLIONAIRE by Hank Locklin, and LEAVIN’ BUT I WON’T BE LONG by The Homesteaders are all big favorites at places where truck drivers hang out. It is significant that America’s juke boxes enjoy the heaviest play in locations where truck drivers congregate. It is significant that Country Music disc jockeys get a great percentage of mail and requests from truck drivers and their wives and sweethearts. It is significant that many of Country Music’s best selling records are those that concern truck drivers. In view of the foregoing we think that greater recognition should be given to the truck driver’s songs by way of the special collection in this album which includes many of America’s favorite truck drivers songs. Perhaps it is the long lonely hours on the road that are spent listening to radio, perhaps it is the romance from chance acquaintances as truck drivers go from town to town, from truck stop to truck stop, and from cafe to cafe. Whatever it is, the life of the truck driver, just like the lore of the railroad, the lore of the cowboy, and the lore of the outlaws, have captured the fancy of a large segment of our population. We dedicate this album, with performances by some of Country Music’s most prominent artists, to truck drivers and their wives and sweethearts everywhere. The jacket also lists the LP this collection was a sort of follow-up to, "DIESEL SMOKE, DANGEROUS CURVES, and Other Truck Driver Favorites", Starday SLP 250. That collection has been featured over at Uncle Gil's and can be downloaded here. 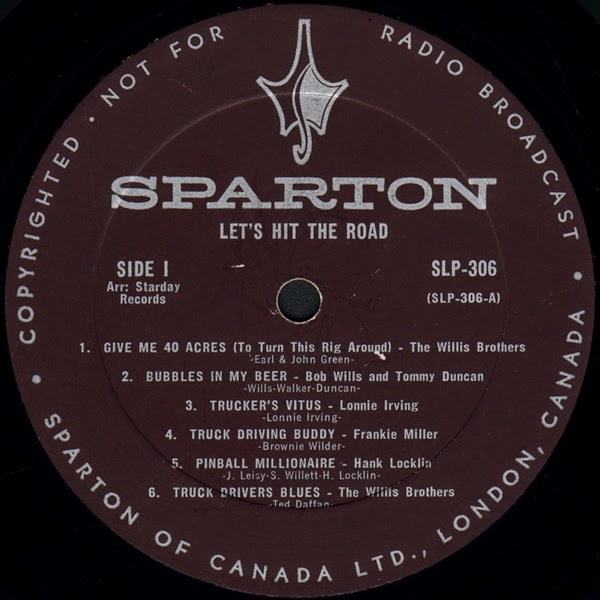 Also, record nerds like myself may notice that the present copy of "Let's Hit The Road" is a Canadian pressing by Sparton. 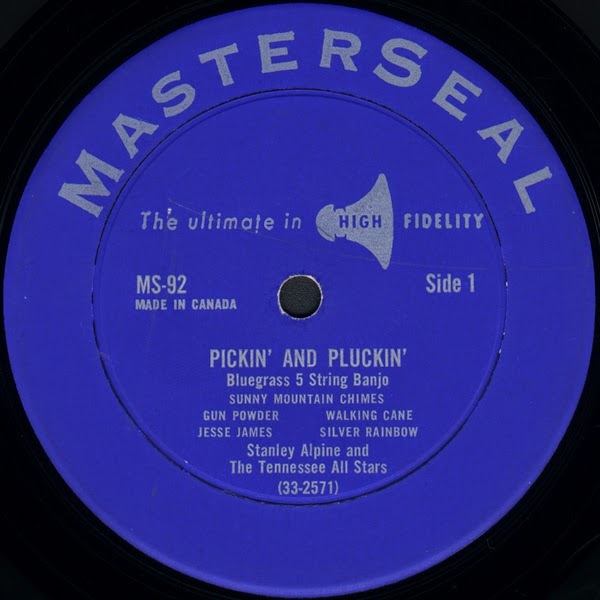 These usually feature a front slick supplied by Starday with a gold or silver Sparton overstamp (on this LP printed on the back instead, probably a mistake) and a back slick printed by Sparton with the London, Ontario address at the bottom in place of Starday's Nashville location. The label used for regular Sparton issues was used for the Starday issues as well, originally silver text on deep burgundy, later changing to a yellow label with "Sparton" in red text. By the late 60's, Columbia was pressing Starday product in Canada, and as a bonus I have included an example here to download, since you can't have too much great Starday trucker material! 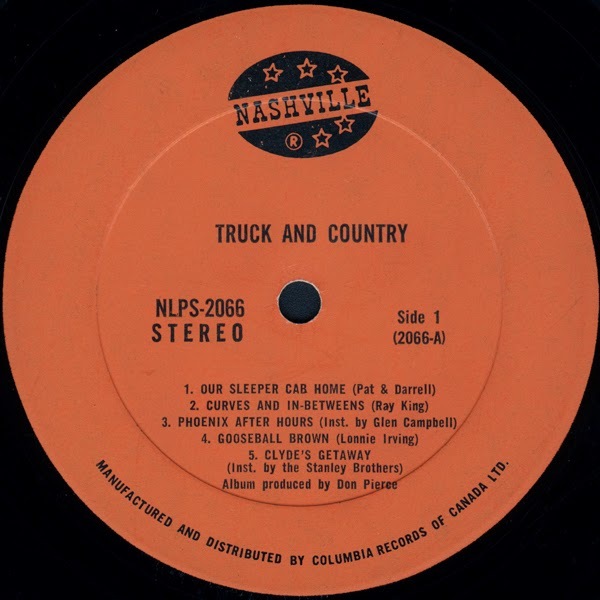 The Columbia Starday pressings used the yellow label with the eagle-on-oval logo, and the Nashville subsidiary pressings (of which "Pure Truck & Country" is one) used the orange label with the "hamburger" Nashville logo. Whew!